Ashley Cole was born on 20th December 1980 in London and went on to become a renowned footballer, and former husband of former Girl's Aloud and X Factor panellist Cheryl Cole, from whom, it is alleged, he strayed many time in well publicised tabloid newspaper headlines. They are now divorced. In 2006 he wrote his autobiography (at the age of just 25 yrs old) which was a flop but in researching for the book Ashley Cole discovered he was a distant cousin of pop star Mariah Carey. 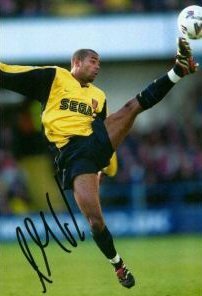 To download and save this celebrity autograph of Ashley Cole simply place your cursor over the celebrity autograph and right click on your mouse, then download the celebrity Ashley Cole autograph onto your hard drive!